VietNamNet Bridge - Vietnamese fashion and garment companies have usually focused on outsourcing and have ignored branding. But the business strategy will no longer fit the new circumstances as more and more foreign brands have landed in Vietnam. Mango has opened two Mango Mega Stores since 2015. H&M opened a shop in HCMC last September. On November 9, Zara opened its first shop in Hanoi. According to Savills, Vietnam is the fifth country in South East Asia where Zara is present. 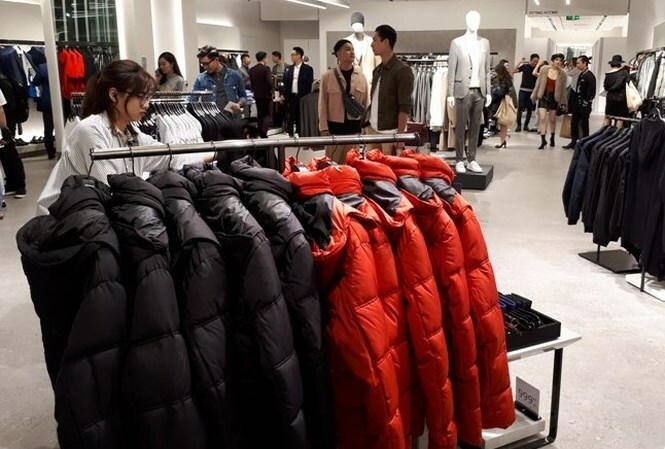 The arrival of Uniqlo in the near future will make the Vietnamese market even more competitive. Dang Phuong Dung, deputy chair of the Vietnam Textile & Apparel Association (Vintas), said the presence of the world’s famous fashion brands will force Vietnamese companies to invest more in branding. “Not many Vietnamese companies can develop their own brands and sell products under their names. In general, they do not pay much attention to branding because of IP infringement and counterfeit products,” she said. The presence of the world’s famous fashion brands will force Vietnamese companies to invest more in branding. “However, as more famous fashion brands have arrived, Vietnamese companies will have to build brands of their own to compete,” she said. Lai Tien Manh, a branding expert, and CEO of Midrand, said the presence of more foreign brands has occurred because income per capita has been increasing and demand is increasing. “Vietnamese companies need to change their business strategies. To date, they have been focusing on doing outsourcing. But they will be uncompetitive if they continue doing this,” he commented. He went on to say that Vietnamese companies are good at producing textiles and garments, but not at fashion design, branding and distribution. They will have to make great efforts to survive in the market. According to MOIT, in the first six months of 2017, the total textile & garment export turnover reached $14.58 billion, an increase of 11.3 percent over the same period last year, much higher than the 6.1 percent growth rate of 2016. Of this, garments brought $11.84 billion, an increase of 9.1 percent. Vietnam has been witnessing outstanding growth rate in textile and garment exports in recent years compared with other exporters such as China, Bangladesh, Indonesia and India. However, Dung commented that the majority of Vietnamese companies focus on exporting products and pay little attention to the domestic market, though it has great potential. Though Vietnam’s textile & garment industry is a world leader, it mostly does outsourcing. Some Vietnamese fashion brands well known in the domestic market such as Viet Tien, Nha Be, An Phuoc and Garment 10 only target mid-range menswear.